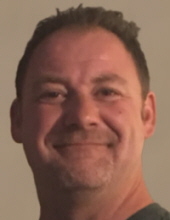 ANDERSON, IN – Billy M. Kinser, 45, Anderson passed away on Monday, July 30, 2018 at his residence unexpectedly. He was born on December 13, 1972 in Anderson to Bryce Mark and Renee (Stephens) Kinser and has lived in the Madison County area all of his lifetime. He attended Alexandria schools. Billy was owner and operator of Kinser Excavating and Concrete for several years. Billy was passionate about his work and was highly regarded as a master concrete finisher. He enjoyed playing his guitar, boating and watching UFC. He had a big heart and an even bigger sense of humor and was known for his talking abilities and storytelling. Billy was an honest and beautiful, free spirit. His smile will be fondly missed and warmly remembered. Services honoring Billy’s life and legacy will take place at 10 am on Friday, August 3, 2018 in the Owens Funeral Home, 412 North Harrison Street, Alexandria. Interment will follow in Anderson Memorial Park. Friends may call at the Owens Funeral Home on Thursday from 5 pm to 8 pm. Memorial contributions are suggested to the Owens Funeral Home to assist the family with final expenses. Envelopes will be available at the funeral home or can be made directly through their web-site, www.owensmemorialservices.com. Donations can also be made to Riley Children’s Hospital in Indianapolis. Owens Funeral Home is honored to care for Billy and the Kinser family. To send flowers or a remembrance gift to the family of Billy M. Kinser, please visit our Tribute Store. "Email Address" would like to share the life celebration of Billy M. Kinser. Click on the "link" to go to share a favorite memory or leave a condolence message for the family.